For most people, traveling by plane is a rare occurrence that may only happen 3 or 4 times in a year. However, others have jobs that require them to pop all over the US, or all over the world on a regular basis. That sort of lifestyle can be very taxing, as you have a weird sense of what home is as your necessities are usually packed neatly away and near by. You also have to pay more attention to the quality of your suitcase, as it will go through in a year what most suitcases deal with in a decade. If you are one of those jet-setters who travels 30 or more times a year by plane, you know a cloth suitcase with wheels that can only go one direction are a nightmare. You need a hard-shelled suitcase that can withstand being rough-housed by baggage handlers on the regular. 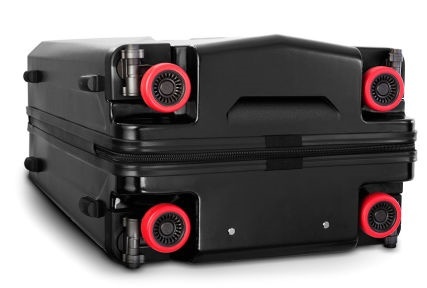 Of course, with the Stealth Suitcase that Heys will be releasing to the market in the fall or winter of this year, you’ll also be able to have the option of retractable wheels. The wheels will give you maximum mobility for running between gates, and the aircraft grade aluminum spinners will make sure the wheels can handle it time after time. The push of a red button will allow you to fold in the wheels, and rotate them inward until they click into place. This gives you more room for your stuff, and helps it keep from being broken while being stowed. This will cost you $250-350 depending on whether you want a 21 or 30” model. If you want a full set, you’ll be looking at around $900.